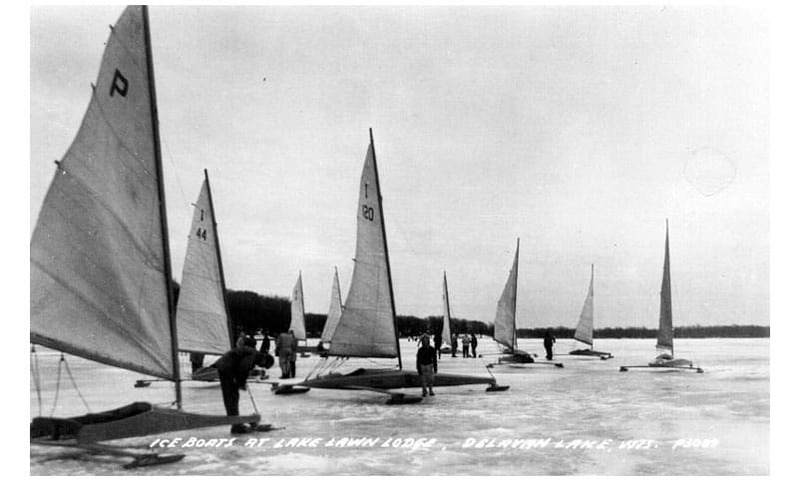 Today’s vintage postcards come from the Geneva Lake area with commentary from Skeeter Iceboat Club member, Jane Pegel. Thank you, Jane, for sharing your memories and providing historical context for these cards. Chris Goes has confirmed the history of the boat. The boat with the “P” on the sail is Pike. This is an open-back Walter Beauvais built “Beau” Skeeter that won the Northwest regatta, season 1934-35, with Harry Melges, Sr., as skipper. That regatta was at Gull Lake, MI. and was the first time that the Skeeters had their own division at the Northwest. In subsequent years, the Beau Skeeters had closed backs. 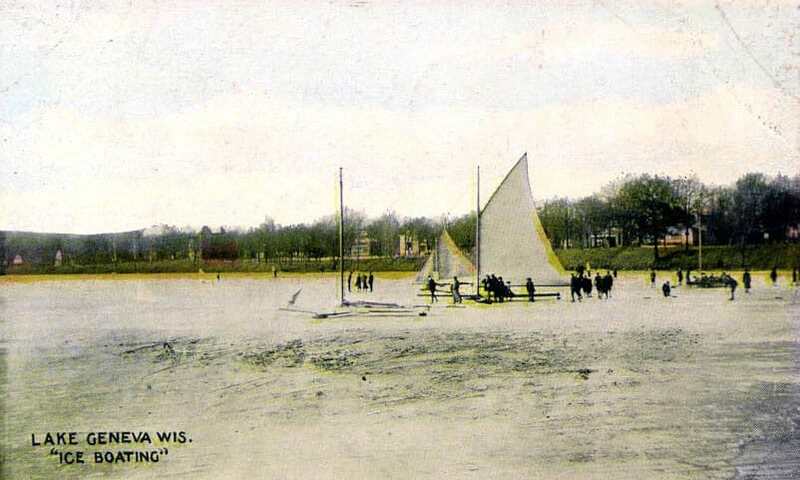 This photo, in front of Lake Lawn resort on Delavan Lake, was taken when the boat was owned by Cuppy Goes. Cuppy also raced a conventional cockpit A division Skeeter and was a Life Member of the Skeeter Ice Boat Club (an honorary status given to members who actively contributed to the Club for a number of years). Cuppy was also a champion C scow sailor and former Commodore of the Lake Geneva Yacht Club. Cuppy’s oldest son, Chris, now owns Pike and sails it on Delavan Lake when conditions permit. Chris is a current member of the Skeeter Ice Boat Club, as are his three sons, Charlie, Eric, and Nels. Eric Goes sails a Nite. Chris also has a gaff rigged stern steerer to sail on Delavan. They all sail at the Delavan Lake YC in the summer and Eric sails Cuppy’s former C scow, also named Pike. The significance of the name Pike is that it was the nickname of Cuppy’s father. 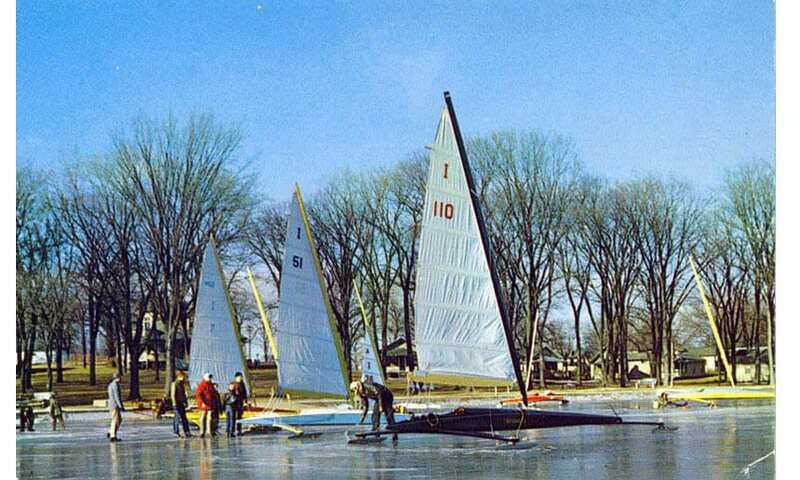 Generations of the Goes family power boats, sail boats, and ice boats have been named Pike. The next generation of Goes sailors is just beginning at the Delavan Lake Sailing School. I-44 was John Clifford. A number of members of the Clifford family were members of the Club in the thirties and forties. each owning a boat. In Club minutes, I learned that the club was organized in March, 1933, as the Beau Skeeter Iceboat Club of Southern Wisconsin. A couple of years later, and for several meetings, changing the name was a topic discussed, with many motions that did not pass. 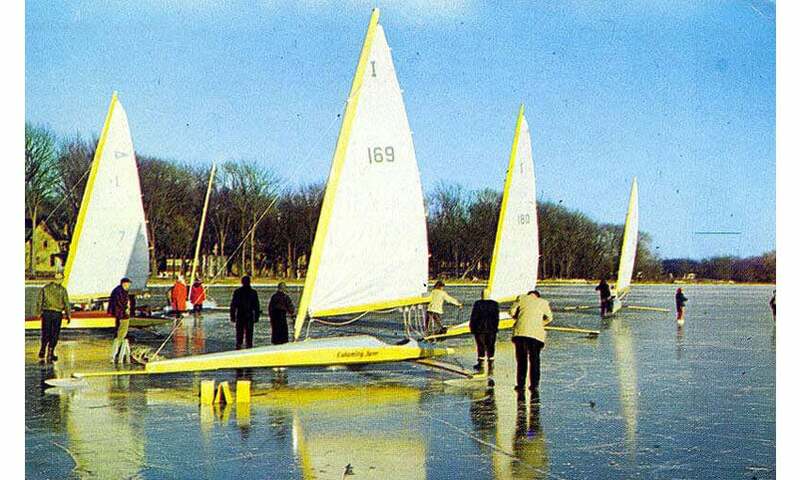 Finally in December, 1938, the name of the club was changed to Skeeter Ice Boat Club. Click here to see 3 more postcards. Of particular interest is I-110, owned by Bill Parks. a former Commodore of the Skeeter IBC. Bill’s boat was a 20 ft. Mead that was modified. Bob Pegel was introduced to iceboating by Bill Parks, and everyone knows the rest of that saga. Gloria Wenzel was crewing for Bill in a Star class regatta in Chicago. This was Buddy Melges’ first Star regatta. That is how Bud and Gloria met, and everyone knows the rest of that saga. Bill Parks passed away a few years ago. He was an Olympic bronze medalist in the 1960 Rome Olympics, sailing in the Star Class. Bill was Commodore of Chicago Yacht Club and chairman of the Governing Committee of the International Star Class Yacht Racing Assn, and held a number of offices of distinction in the United States Yacht Racing Union and US Sailing. In the photo with Bill Parks, I-7 is Harry Melges, Sr., Mickey Finn. I-51 is Don Krause’s boat. Don lived in Williams Bay and had a succesful excavating business. Don raced successfully and Buddy Melges also won some titles while sailing Don’s boat. The Calamity Jane was a 20 ft. Mead that was upgraded with springboard, 21 ft, mast, and 17 ft. runner plank. in 1948 my father bought that boat for me from Don Campbell. The name of the boat was Holy Smoke and originally had a 13.5 ft. plank and 19 ft. mast. I was a high school student at the time. While competing in the 1956 ISA in Hamilton, the upgraded hull broke just aft of the springboard. The hull was scraped and the parts sold. The following season (1956-57) I began racing a DN. Sailed my last DN race on March 14, 2014. These gaff riggers were before Jane’s time but are a reminder of when wealthy Chicagoans like the Wrigleys (of chewing gum fame) had ice yachts on Geneva Lake. A few years ago, a Stern Steerer from the Wrigley estate was purchased and restored by three men who sail her on White Bear Lake in Minnesota. Another old Wrigley Stern Steerer sails on the Hudson River. 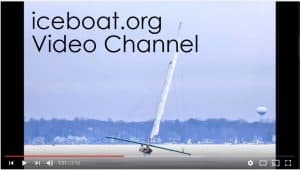 Read more about that on White Wings and Black Ice, truly the best website devoted to historic North American ice yachts around.